“Won’t You Be My Neighbor?” (Focus Features). America was divided, tense and angry in 1969, when Fred Rogers faced a U.S. Senate Subcommittee poised to grant President Richard Nixon his requests for deep budget cuts for public broadcasting. Rogers told the senators why he kept telling children they were unique and special. But he also talked about fear, anger, and confusion – because that’s what children were feeling. The senators nixed the cuts, and the Rev. 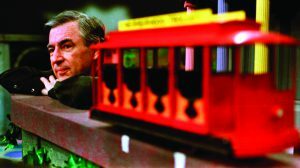 Fred Rogers – an ordained Presbyterian minister – continued with his complex blend of television, child development, and subtle messages about faith. The Senate showdown is a pivotal moment in “Won’t You Be My Neighbor?”, a Focus Features documentary just released to theaters nationwide. In the documentary, Rogers summed up his approach: “Love is at the root of everything – all learning, all parenting, all relationships. Love, or the lack of it. And what we see and hear on the screen is part of what we become.” The space created by a TV lens, between himself and a child, was “very holy ground,” he said. Mister Rogers used a strange strategy to become a force in American culture. Basically, he took the alleged essentials of children’s entertainment – shallow characters, loud action, flashy graphics, and stupid gags – and ignored them all. Over and over, he slowly donned his comfy sweater and sneakers and quietly told kids that he wanted to be their neighbor. But he also kept addressing questions about why bad things happen to good people, the hard questions that sent Rogers to seminary, even while he kept working in television. While his cheery attitude framed everything, Rogers was actually handling – in kindergarten-level scripts – ancient questions about “theodicy,” attempting to reconcile the existence of a loving God with the reality of evil in the world. After the death of Sen. Robert Kennedy, Daniel Tiger – the puppet that frequently voiced Rogers’ point of view – asked: “What does ‘assassination’ mean?” Another script focused on divorce. When a fish died in the Neighborhood’s tank, Rogers talked about the reality of death, but stressed the goodness of life and the need for hope. “That show was about as close to Easter as he could get on TV,” said Wirth. More than anything else, said Wirth, Rogers was a realist who believed that “nobody is ever abandoned, no one is every really alone, because God is in the Neighborhood, too. … That’s what Fred believed and that tells you what you need to know about who he was. Terry Mattingly (tmatt.net) leads GetReligion.org and is Senior Fellow for Media and Religion at The King’s College in New York City. He lives in Oak Ridge, Tennessee. i just found out about your website.